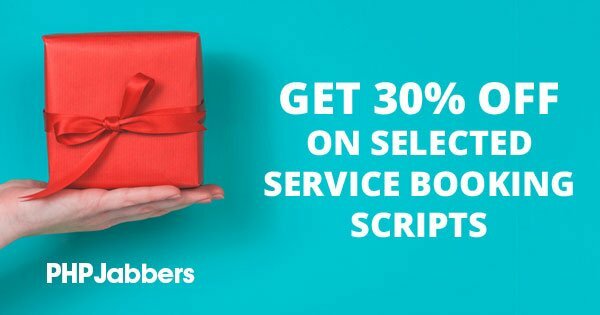 Get our service booking scripts with 30% OFF! In the last couple of years, driven by customer demands we produced and launched a series of PHP scripts for particular types of websites that better fit the specifics of the respective industries. Along with the positive feedback received from many of you, we are often asked about the distinguishing features of scripts that appear to be very akin to each other. This applies also to our reservation systems based on the time slot booking principle. * SPECIAL PROMO included at the end of the post! In this review, we will go over the key differences between our service booking scripts: Appointment Scheduler, Service Booking Script, Time Slots Booking Calendar, and Class Scheduling System, so that you can choose the software that best matches your functionality needs. 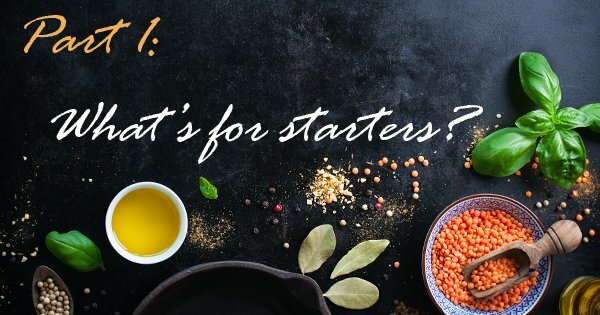 As their names suggest, they all show service availability and allow simple online bookings and payments, still, each of them has its own special powers. Whichever you choose in the end, it will help you organize your service schedule more easily, manage appointments more efficiently, and bring online sales to another level! Our online appointment scheduling software is suitable for websites intended to offer different types of services which are provided by multiple employees. You can create short descriptions for each of your services, add an illustrative image, and specify price and duration. Customers can also read more about each of your team members, their skills, specialties and professional experience. In order to ensure an enhanced usability, we have added an intuitive appointment calendar showing service availability and days off by aggregating the individual schedules of all employees. You can set their default and custom working time including lunch breaks. Depending on your business and internal rules, you can grant administrator's access to employees so that they can configure their profiles and timetables by themselves. Thanks to the smart Email & SMS notifications feature, your staff members will always be up to date with the latest bookings. Customers on their part can pick a date and browse both by service and by professional. Making an online appointment takes a few minutes - you just have to select the time and proceed to checkout. You can set your payment options and temporarily disable payments if such a need arises. For your convenience, we have also integrated an invoicing module allowing you to make your own invoice template and add your company details. Thus, you can manage bookings and track payments from a single place. The Appointment Scheduler goes even further - it can help you analyze your business by generating detailed reports about the number of bookings for each employee or service and their monetary expression. >> Check Appointment Scheduler demo! Best fits: small SPA & wellness studios, beauty & hair salons, fitness & sports clubs, home maintenance services, etc. The service booking system is also developed specifically for websites offering a variety of services online. In terms of functionality, the web app is very similar to the Appointment Scheduler - you can list your services, manage prices, add your working time, take bookings, and process payments, still, the service scheduling software is a rather simplified version of the latter. The main point that makes them different is that with the Service Booking Script clients cannot choose an employee. Another key difference between both software solutions is that the service booking software allows you to manage only one schedule for the whole system. Customers select their preferred date and time in Step 2 via a fancy "Date & Time Picker" showing the available time choices. If your establishment is growing and more complex, i.e. you offer many different services requiring good representation and you have a big professional team that is very well qualified and worth showing to the world, then we would recommend you the more sophisticated and advanced of both scripts - Appointment Scheduler. The Service Booking Script, by contrast, is a very good start for small and family businesses that wish to cut the administrative overhead and improve customer experience. >> Check Service Booking Script demo! Best fits: hairdressers, therapists, masseurs, private trainers, group classes and events, venue, etc. 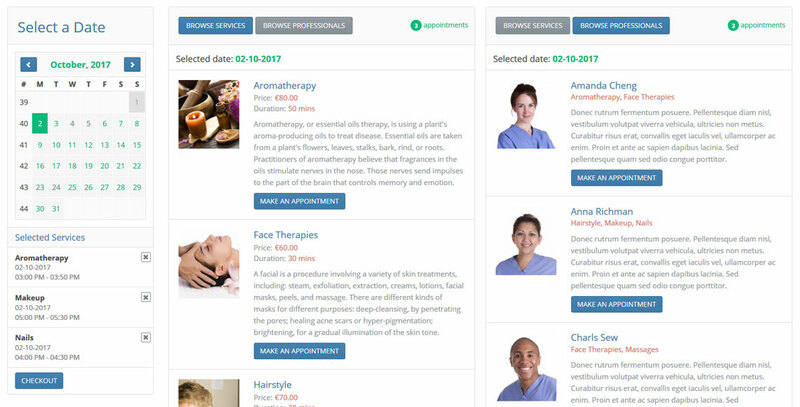 Time Slots Booking Calendar is a multi-calendar online booking system allowing clients to book both individual and group appointments. This means that one customer can reserve multiple time slots for different dates. For example, you can book an appointment with your chiropractor on September 29, 4 pm - 5 pm and a second one on October 4, 3 pm - 4 pm. If you organize group classes, seminars, workshops, etc., you can allow multiple bookings per slot by increasing the number of bookings per slot on the back-end system. This will enable the predefined number of people to book the same slot. In contrast to the two aforementioned reservation systems, which enable you to choose among different services (options), by means of the Time Slots Booking Calendar customers only book a specific period of time. You have the flexibility to use it for various appointments or a particular service described on your website. For example, you can create several calendars for different needs - services, employees, venue. Administrators can configure the number of time slots per day, set default and custom time slot length, and standard or custom price per slot for each day of the week. For example, booking a massage for Monday 9 am - 10 am can cost $25, whereas the price for Monday 6:30 pm - 7:30 pm can be $5 higher, because of the late hours. You can also set lunch breaks for each day of the week as well as custom working hours for particular dates. Depending on the number of services or events you offer or organize, you can add as many calendars as you wish. Each Time Slots Booking Calendar has individual settings and can be integrated into different places on your website. Your site visitors can switch between weekly and monthly view, pick their preferred dates and then select the time slots. The time slot booking system allows for a simple booking management, flexible online and offline payments, and also contains a built-in invoicing module that will help you to issue and send invoices and keep track of their payment status. >> Check Time Slot Booking Calendar demo! Best fits: education and training organizations, teachers, courses, seminars, etc. Our PHP class booking system is a niche script with a very distinct application. You can use this reservation software to present and promote courses and seminars on your website - foreign languages, crafts, business skills, singing classes, musical instruments, and you name it! Each class profile goes with a short description, a suitable image, class size, price, duration and available dates. In Step 2 of the booking process, students can see the tutors assigned to the selected course and read more about each of them. The teacher profiles can be created by administrators and updated by teachers themselves. They just need to log into their profiles where they can review all their pupils, check their personal schedule including the venue where each course will be taking place. Students can book classes with a few mouse clicks and pay online via different payment processing providers. After their enrollment, they can log into their private accounts to change their personal details, check their schedule and payments history. The Class Scheduling System also allows you to personalize different notifications which will be sent automatically to course participants upon each new registration, booking and payment. This functionality will surely spare you lots of lengthy phone calls and misunderstandings! All in all, the online class booking system will help you organize and coordinate your courses between all participants and teachers, manage bookings and handle the financial part more easily and efficiently. >> Check Class Scheduling System demo! 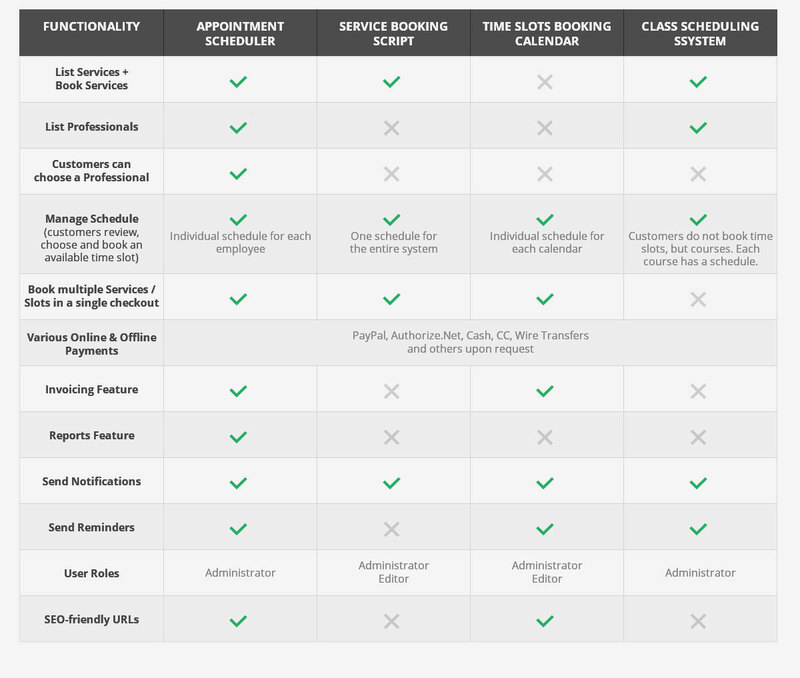 To make your choice even easier, we have compiled the table below which clearly and neatly compares the main features of all four service booking scripts. All service booking PHP scripts above have a mobile-friendly design and different color themes so they can smoothly blend with your website and improve the user experience. Should you need any custom modifications, we can either send you the full source code (Developer Licence) or deliver the necessary tweaks upon request. We can also unbrand each of the reservation systems so that you can present it to your customers and extend the free trial if you need additional time to explore its features. 1 Comments to "Service Booking Scripts Review"